Embattled U.S. Homeland Security Secretary Kirstjen Nielsen was forced out rather than resigning willingly, several U.S. news outlets are reporting. 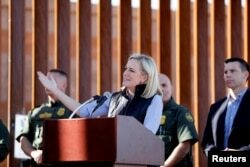 Nielsen submitted her resignation Sunday night after meeting at the White House with President Donald Trump, who almost daily has voiced his anger at the thousands of undocumented Central American migrants crossing the southern U.S. border with Mexico to seek asylum in the United States. The news accounts say Nielsen had no intention of quitting when she arrived to meet with the U.S. leader, but that he was determined to ask for her resignation, which she submitted shortly after the meeting. 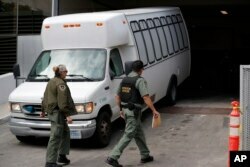 FILE - A van carrying asylum seekers from the border is escorted by security personnel as it arrives to immigration court, in San Diego, California, March 19, 2019. Immigration hardliners in the White House, including National Security Advisor John Bolton and immigration policy advisor Stephen Miller, had been pushing Trump to oust her, viewing her as not tough enough to deal with the crisis at the border. Trump announced that current U.S. Customs and Border Protection Commissioner Kevin McAleenan will replace Nielsen, becoming the acting secretary of the Department of Homeland Security, with Nielsen staying on through Wednesday in a brief transition. "I have confidence that Kevin will do a great job," Trump said. In Twitter comments, Trump twice contended that the United States has no room for more arriving immigrants. Last week, Trump retreated from a days-long threat to close the U.S.-Mexico border after advisors told him that a closure would have a significant negative impact on the U.S. economy, the world's largest. Instead, he said Mexico had a year to curb the surge of migrants and interdict the flow of illicit drugs into the U.S. or else he would impose tariffs on automobiles Mexico exports to the U.S.
"Mexico must apprehend all illegals and not let them make the long march up to the United States, or we will have no other choice than to Close the Border and/or institute Tariffs," Trump said. Also last week, Trump rescinded his nomination of Ronald Vitiello as the new Immigration and Customs Enforcement chief, saying he wanted to go "in a tougher direction." Nielsen was the Homeland Security secretary for 16 months, overseeing the controversial separation of thousands of migrant children from their parents as they arrived at the border, a policy overturned in a court decision. She also secured an agreement with Mexico to start processing U.S. asylum requests while the immigrants were still in Mexico. FILE - Then-Department of Homeland Security Secretary Kirstjen Nielsen visits U.S. President Donald Trump's border wall in the El Centro Sector in Calexico, California, Oct. 26, 2018. U.S. officials say the immigration crisis has worsened in recent weeks, with frequent complaints from Trump. He declared a national emergency to build a barrier wall along an increasing expanse of the border, tapping funding from various government programs after Congress refused to fund wall construction. Sixteen states and other groups have filed suit to contest his action, but the dispute has not been resolved. Faced with declining support within the White House, Nielsen submitted her resignation, saying in a letter to Trump, "Despite our progress in reforming homeland security for a new age, I have determined that it is the right time for me to step aside." House Speaker Nancy Pelosi called the Trump administration's immigration polices "cruel" and said they "have only worsened the humanitarian suffering at the border." "It is deeply alarming that the Trump Administration official who put children in cages is reportedly resigning because she is not extreme enough for the White House’s liking," Pelosi said in a statement. "America needs a Homeland Security Secretary who will respect the sanctity of families, honor our proud heritage as a nation of immigrants, and restore sanity to this Administration’s policies," she said. FILE - In this June 20, 2018, file photo, immigrant children walk in a line outside the Homestead Temporary Shelter for Unaccompanied Children, a former Job Corps site that now houses them in Homestead, Florida. Nielsen faced a public outcry over the administration's highly unpopular policy of separating migrant families when they crossed into the U.S.
Thousands of young children were taken from their parents and held in separation facilities. Nielsen was responsible for executing that policy while at times denying such a policy existed. Trump thanked Nielsen for her service.